Sensei David Craigie and some of his Young Dojo students participated in the 2017 Shihan Ken Seminar, at the invitation of Hanshi Howard Lipman. Sensei David and Hanshi Howard have a long history of training together. Sensei David began his studies of Kyokushin two years after Hanshi Howard. Through the course of the seminar, Sensei David and his students formed great training bonds and friendships with the KIMAA students, their martial arts spirit gelling well together. It was Hanshi Howard’s great pleasure to invite Sensei David and his dojo to formally join Kyokushin International Martial Arts Australia. Sensei David accepted, making Young Dojo an official KIMAA branch – the seventh of the organisation. 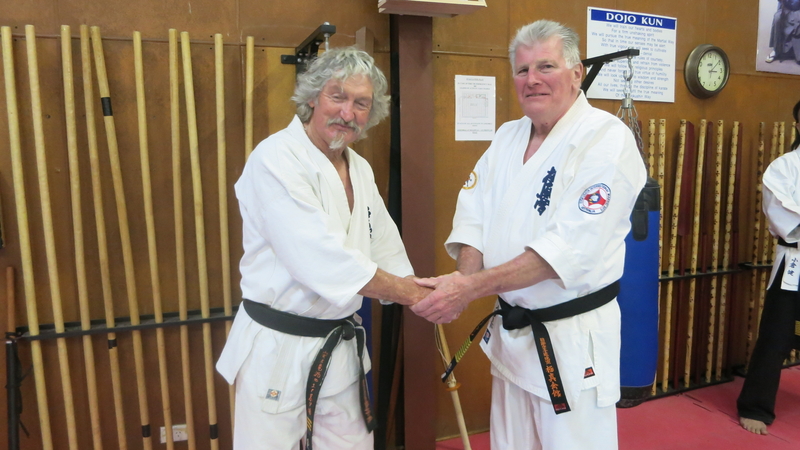 Sensei David Craigie and Hanshi Howard Lipman, after Sensei David formally joined KIMAA. 10 September 2017. Congratulations and welcome to Sensei David and all his students. We look forward to training further together. Osu!